Antonio Banderas is playing one of his heroes. No, not the swashbuckling masked swordsman named Zorro, but Pablo Picasso in Genius: Picasso, the second install of National Geographic Channel's Genius anthology series. 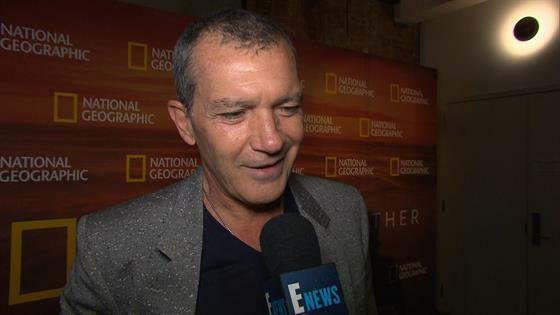 Banderas said, "The sense of responsibility represents kind of a burden on my shoulders." The Emmy and Golden Globe nominee said he was escaping the role for years until somebody with the expertise of executive producer Ron Howard and a platform like National Geographic Channel with "credibility" and "prestige" came into the picture. "It's important when you do a biopic to have that security that what you're doing is actually based on facts because you're talking about a human life [Laughs.] that affected millions of people," he told us. The 10-part series explores the Spanish-born artist's passion, creative drive, tumultuous marriages, affairs and shifting political and personal alliances. Banderas said he went into the project trying not to fail. "To not fail not just the character, but the truth," he said. "Nothing is going to take me away from being a Picasso lover of his art and everything he has done as an artist, but there are certain sides of the human being that are darker, so we have to tell the truth." The cast of Genius: Picasso also includes Alex Rich as the younger version of Picasso, Poppy Delevingne, Sebastian Roche, T.R. Knight, Seth Gabel and more. Genius: Picasso debuts Tuesday, April 24 at 9 p.m. on NatGeo.